November 2012 wasn’t too crazy a month for browsers, but there were some notable milestones. It was the first full month of IE10 availability. Mozilla launched Firefox 17 and Google released Chrome 23. 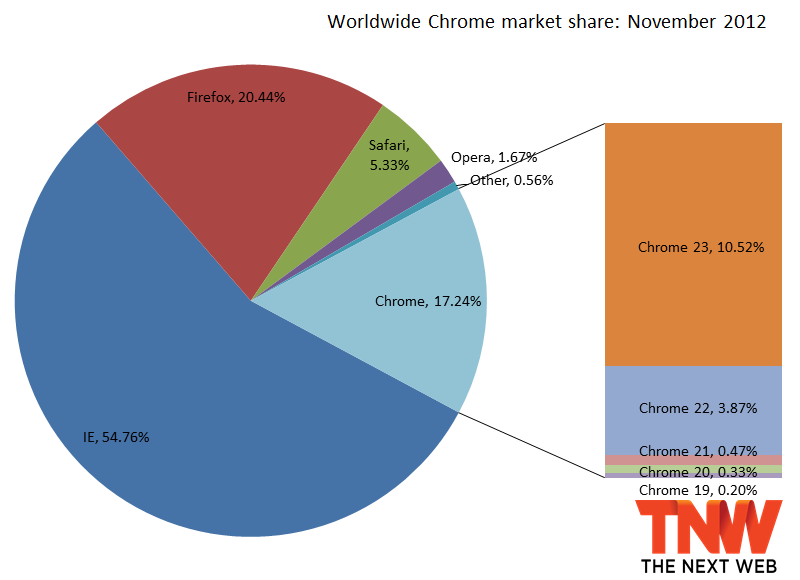 The latest market share numbers from Net Applications show that Chrome was the only loser last month. Between October and November, Internet Explorer gained an impressive 0.63 percentage points. Firefox meanwhile regained its recent losses, grabbing 0.45 percentage points, while Chrome fell a whopping 1.31 percentage points (more than in September and October combined). Safari gained 0.04 percentage points and even Opera managed to pick up 0.07 percentage points. At 54.76 percent, Internet Explorer is now indeed growing again, ensuring it won’t lose half the market share pie anytime soon. Windows 8 is out, and although a preview of IE10 for Windows 7 was released, a final version isn’t expected till next year. As such, it’s all up to the new operating system to keep things moving forward in IE land through 2012. 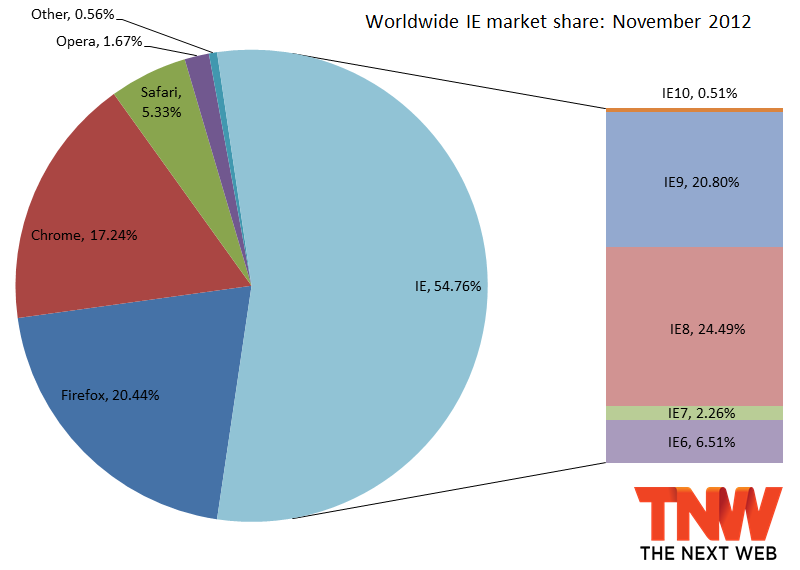 IE10 managed to capture 0.51 percent in November, while IE9 grew to 20.80 percent (up by 0.69 percent percentage points). IE8 lost just 0.01 percentage points, but it’s still the world’s most popular browser at 24.49 percent. IE7 fell 0.06 percentage points and IE6 fell 0.34 percentage points. Everyone can’t wait for it to fall below the 5 percent mark, but that won’t happen till sometime in 2013; even Microsoft wants it to die; but China isn’t letting that happen. 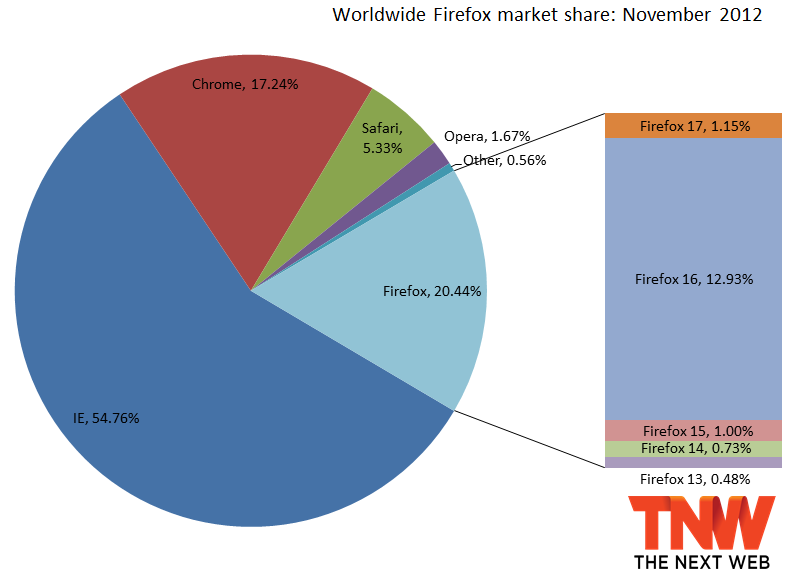 At 20.44 percent, Firefox has once again regained its title for owning one-fifth of the market. Firefox 17 only captured 1.15 percent last month, but that’s simply because it hasn’t had a full month of availability yet. Firefox 16 grabbed 7.09 percentage points, while the older versions all lost share: Firefox 15 tumbled 6.82 percentage points, Firefox 14 was down 0.34 percentage points, and Firefox 13 lost 0.08 percentage points. At 17.24 percent, Chrome is still just behind Firefox. This is the third month’s loss for Google’s browser, and right now it’s not looking as if it will pass Firefox this year. Nevertheless, Chrome 23 captured a solid 10.52 percent of the market. All the other versions lost share: Chrome 22 was down 11.15 percentage points, Chrome 21 fell 0.22 percentage points, Chrome 20 dropped 0.10 percentage points, and Chrome 19 dipped 0.09 percentage points. Once gain, the majority of Chrome users are on the latest version, despite its very recent release. I said previously that I expected IE9 to pass IE8, for Chrome to pass Firefox, and for IE10 to start a steady growth, all before the end of the year. The first two are definitely not happening, and the third one is still too early to tell.